The Australian hardwood plantation industry is challenged to identify profitable markets for the sale of its wood fibre. The majority of the hardwood plantations already established in Australia have been managed for the production of pulpwood; however, interest exists to identify more profitable and value-added markets. As a consequence of a predominately pulpwood-focused management regime, this plantation resource contains a range of qualities and performance. Identifying alternative processing strategies and products that suit young plantation-grown hardwoods have proved challenging, with low product recoveries and/or unmarketable products as the outcome of many studies. Simple spindleless lathe technology was used to process 918 billets from six commercially important Australian hardwood species. 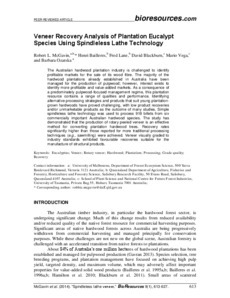 The study has demonstrated that the production of rotary peeled veneer is an effective method for converting plantation hardwood trees. Recovery rates significantly higher than those reported for more traditional processing techniques (e.g., sawmilling) were achieved. Veneer visually graded to industry standards exhibited favourable recoveries suitable for the manufacture of structural products.